Between Turin and Auburn Hills, you have roughly 60 direct reports. How do you handle all of them? Easily. They have a huge amount of discretion in what they do, and we interface on issues that are relevant. But my role is not to lead on their behalf. It is to give them the space to lead. Sergio Marchionne has been a whirlwind of activity since taking over as CEO of Chrysler Group on June 10, the day the company emerged from U.S. government-sponsored bankruptcy. Since then, the 57-year-old Italian-Canadian executive has set about trying to duplicate the near-miraculous comeback he engineered at Fiat. When Marchionne took over at Chrysler, he imposed a five-month quiet period as he labored to put his plan in place and align his management team. On Nov. 4, he unveiled the plan in an eight-hour marathon news conference. 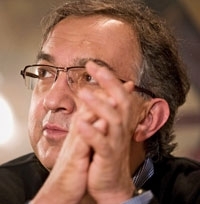 Marchionne spoke with Staff Reporter Luca Ciferri at Fiat headquarters in Turin, Italy, on Nov. 21. In November 2008, you predicted that within 24 months, just six volume automakers would survive worldwide. A year later, Fiat-Chrysler is still the only step toward this consolidation. I am relatively decent at calling directional moves; I may not be absolutely accurate on calling the exact timing of that shift. I don't doubt that we need to move in that direction, but a lot of it depends on a variety of factors outside of my control. The retention of Opel by General Motors is one affirmation of the fact that mass does matter. In my remarks to the Chrysler people when I took over on June 10, I said everything that Fiat has is at the disposal of Chrysler, and so the speed with which we execute this alliance is now really being seen. The fact that we are going to be launching the first A-segment car less than 18 months after the alliance was created is an indication of the speed at which this cooperation is working. Not only are we going to introduce an A-segment car, but it's going to be locally produced in NAFTA. And the engines will be locally produced in NAFTA, so we have overcome all the homologation issues associated with the transfer of the platform into the U.S. at record time. Your five-year plan forecasts that Chrysler's operating margin will peak at 7 to 7.7 percent of revenues in 2014. In November 2006, you predicted that Fiat Group Automobiles' operating margin would peak at 4.5 to 5.3 percent in 2010. How could Chrysler's post-global recession peak profitability be 50 percent higher than Fiat Group's pre-global recession assumptions? For one very simple reason: The Obama administration has done what Europe has been unwilling to do. In November 2006, when I announced Fiat targets for 2010, those margins would have reflected a competitive state of the European car industry which today continues to be unrectified. In Europe, structural overcapacity has not been addressed, and nationalistic interests continue to prevail over the overall health of the industry. The Obama administration, like it or not, has forced a restructuring on this industry where the emerging companies, post-bankruptcy, are going to be much better suited to drive returns on capital which are adequate with the risks that are being taken. So I do think that a decent business on the car side which is run efficiently can produce 7 to 7.7 percent in the United States. Is that number possible in the European marketplace given what exists as an industrial landscape? The answer is no. That is untrue. Chrysler is not controlled by the U.S. Treasury. The U.S. Treasury is the primary, and to this day probably the only, lender to Chrysler. We have a unique relationship with them, but they are not a controlling interest in Chrysler. There is an independent board that oversees the operations at Chrysler. Our plans, our doings, our interface with the U.S. Treasury and with Fiat are subject to the supervisory role of a board of directors, and they are exercising that right. This is not being done on behalf of the U.S. Treasury; it is being done in order to protect all the interests of the shareholders and the other stakeholders in Chrysler. The biggest shareholder today of Chrysler is the voluntary employees' beneficiary association, a health care trust that has a completely different set of objectives. When something is good for Chrysler but it isn't good for Fiat, or vice versa, how do you resolve the conflict? The only thing I can do is make stuff available out of Fiat. And that I do. So I open doors and I make sure that the contacts happen. I leave to other people to assess the adequacy of the commercial arrangement between Chrysler and Fiat. There are committees on the management team that are designed to deal with that relationship. And they have direct responsibility to the board, to the people who are not conflicted from the arrangement. You recently said Fiat and Chrysler together would reach the 5.5-million-unit-a-year level you consider critical for survival. You say Chrysler will be a 2.8 million animal in 2014. When could the 5.5 million target be reached? Certainly before 2014. I mean, the writing is on the wall, right? Half of it is coming out of Chrysler. More [information] on the Fiat side will come on an investors' day we are planning for the first quarter of 2010. Renault-Nissan CEO Carlos Ghosn predicts that pure electric vehicles will cover 10 percent of global demand by 2020. All his competitors' predictions are in the low single percentage digits. What is your view on the future of EVs? We're going to continue to work on this, but we need to resolve the issue of economies of scale and storage of energy. In the absence of a technically viable solution to this problem, I think that this technology will have a limited purview. That's why we identified in the Chrysler plan the first application on a light commercial vehicle, because that marketplace can tolerate the limited performance of electric vehicles which are not universally acceptable. If you want to drive from Chicago all the way down to Florida, you are not going to be able to do it on an electric vehicle unless you intend to stop and recharge as you go through. In the organizations you head, there are no chief operating officers -- just strong governing bodies made by the top 15 to 25 executives. Is this going to change, with more delegating to a new breed of COOs? No, I think the structure works well. The problem with pulling layers between me and the management team is you end up filtering information which is useless, so you might as well throw all the garbage on the table and we'll clean it up as a team. So far you have moved just a handful of Fiat executives to Chrysler. Is this going to change? Can we expect Chrysler executives to join Fiat? I hope that I can bring Chrysler people here. I think it would be good for them. It would be good for Fiat. There's talent there; you can't underestimate it. Is there a specific sector in which you already see people potentially moving from Auburn Hills to Turin? One area is gas powertrains. Chrysler is much better than we are at this, so far. Another is creativity. The creativity we saw on the Nov. 4 presentation was an indication of what their organization was capable of doing. One of the things that I reviewed today was the advertising approach to the United States. It is amazing as to the level of creativity that sits within small organizations spread out across the U.S. I mean, it's just all over the place. The video we showed on Nov. 4 on the DNA of the Chrysler brand came out of an organization Chrysler had never interfaced with before. I think we need to be able to try and get to those pools of talent and give them access to our house. Could Fiat-Chrysler become an alliance such as Renault-Nissan, with cross- shareholding and a clear separation of product and regional responsibilities? That's one model. The other model that's possible is one that effectively allows for a much deeper level of integration which does not require cross-shareholding between the two organizations as long as the industrial objectives are commonly shared. This whole notion of creating cross-linked ownerships is valid only to a point. I need cross-architectures. I need commonalities across as many of the technical pieces of the backbone as I can. I need to be able to look at Chrysler and say, “You are the most efficient producer of this platform; I delegate you the right to manufacture on my behalf and on your behalf.” That is a discussion we have had with incredible ease with Chrysler. Because of that openness, it has also opened Chrysler to the recognition that Fiat may be better suited to do some things on some architectures than Chrysler can. Your plan for Chrysler hinges on getting new customers to buy smaller, more fuel-efficient vehicles. How do you convince a Honda or Toyota owner that Chrysler can provide something better? That we are going to make smaller cars and that we are going to make fuel-efficient vehicles are two separate assertions. We need to be very, very careful at what I would call overt attempts at converting the world to the virtues of smaller cars. The American consumer by definition is going to play in a different-size sandbox than Europeans. It would be very stupid for us to go in there and assume that the same type of European styling and sizing -- which has driven the development of the Fiat auto portfolio in a very focused way in the last five years -- would prevail in the United States. So we are going to bring in the smaller cars. The 500 at the end of 2010 is the first attempt to do so. We will bring B (subcompact) sedans by American market standards, and we will continue to populate the lower end of the spectrum and continue to make those cars available. But I still think the heart of the U.S. market will continue to be in the C and D segment (compact and mid-sized cars). That's why I think people underestimate the impact of Fiat's intervention. There is a very clear attempt at downsizing engines to achieve the same output in terms of performance, and to match those engines with transmissions which deliver a higher level of mileage and efficiency. We will also bring in Fiat technology as applied to current powertrain structures within Chrysler, including the launch of the new V-6 Pentastar engine which will be available on the Grand Cherokee in May of 2010. These are probably the most significant immediate benefits of the intervention of Fiat onto Chrysler. Fiat is a pioneer in common rail diesel technology. Why not make Chrysler a leader in the North American diesel race? Chrysler is the smallest of the three automakers in Detroit. It is coming back to life after a relatively uneven past and an uneven history. Chrysler has to be very careful about making assertions about the fact that it is going to lead anything anywhere. I much prefer for facts to prove the leadership as opposed to threatening people with leadership. Up to last June, a lot of people thought that we should be dead. For me to stand up in the Nov. 4th presentation and claim that we are going to lead the world out of the wilderness would have been as ludicrous a statement as I could possibly have made. What is absolutely clear is that on the diesel side, there is no carmaking company anywhere that has the same level of technology that Fiat has. The introduction of Multijet 2 in Europe on the (Fiat) Punto Evo and the (Alfa Romeo) MiTo is an indication of the amount of money and effort that we devoted in continuing that leadership in diesel. That is available in its entirety to the American marketplace, and it will hopefully find its first visible application in Canada. Is Olivier Francois' leadership of Chrysler and Lancia a temporary step to align future brand positioning, or will it lead to a single product range sold under different brands in different regions? Since you are listing all the options, there is a third one: one product portfolio sold under one brand. The Francois appointment is not temporary; it's permanent. I think it will take some time, but the Lancia and the Chrysler brands will act as one brand going forward. Obviously the Chrysler brand has international recognition. It carries the name of the corporate group in the United States. It has a much larger visibility. Nevertheless, Lancia certainly in some of the European countries has long, well-established historical roots. We need to find a way to make Chrysler and Lancia co-exist and not fight. Brand rationalization continues to be the key driver here. It takes a huge amount of money to maintain a brand. Do you envision a similar shared future with Dodge and Alfa Romeo? (Dodge brand CEO) Ralph Gilles did an incredible job in my view in presenting the Dodge brand on Nov. 4th. I think it was a very clear attempt at assigning Dodge a DNA; the separation of the Ram brand from Dodge helped a lot in providing that clarity. But this does not mean that Dodge can become a European or a universal brand. There are parts of its product portfolio that undoubtedly always remain Dodge. The Challengers and the Chargers are by definition American vehicles, and you cannot turn them into anything else. We would be doing a huge disservice to Dodge if we tried to de-Americanize those nameplates. Other products within the Dodge brand have a utilization that goes beyond the Dodge brand outside the United States -- models that are capable of being rebadged and more efficiently distributed internationally by Fiat. Our immediate task now is to see what else sits within Dodge that can be used internationally by the Fiat brand. The Alfa brand is a different story. The heritage of the Alfa and Dodge brands is completely different, the DNA is completely different. I can always find common elements in both, reducing everything to “it's got four wheels and four doors.” And I can make myself happy and say, “Look, these brands can drive together.” We would lose a lot of the appeal of Alfa Romeo if we try to Americanize it through a merger with Dodge. That's not to be of disservice to the Dodge brand. In 2011, the Jeep Commander may be built overseas. In China? Russia? The Commander and the Grand Cherokee use the same manufacturing infrastructure. Once I convert all to the new Grand Cherokee, that manufacturing site does not have the capability of producing a Commander. So I need to find an alternative to the production site. It may be available in a variety of places. China and Russia are possibilities. Chrysler's dealer body has been badly demoralized by the trip through bankruptcy and the decision to eliminate 789 dealerships. What can you do to help restore the trust that was lost? We can draw a parallel between the Fiat and the Chrysler experience. We need to acknowledge the fact that rationalization of the dealer body, the selection of the number of dealers that has survived the bankruptcy process, is due to the fact that the future could not have maintained and supported such a distribution network. That decision is irrefutable, and I think that it was done on equitable grounds. The dealers that have been retained have actually fared relatively well even during the bankruptcy period. If you look at the operating margin and the return on equity that these dealers have had on average, you would be impressed. They have all performed well. The important thing for dealers is to focus on the future. The Nov. 4th presentation for us was the first day; it was effectively the debutantes' ball of Chrysler. The feedback that came back from the dealer body was incredibly positive. They understand the fact that the unbundling of the brands is going to be crucial to the success of the franchises they have. They are all sharing in that sort of enthusiasm of what the future will hold. Countering this enthusiasm is the reality of a market which continues to be difficult in the United States and which, unfortunately, has got a customer base that is somewhat skittish in its attitude towards Chrysler. I'd be lying if I told you that the American consumer thinks that Chrysler is completely out of the woods and that it deserves a second chance. In a lot of ways it is no different than what we found at Fiat when Fiat was in similar financial straits. We used a very sequential, very methodical approach to build consumer confidence. All the conversations I've had with the dealer council suggest they support the process we are taking. You can't expect miracles overnight. Many dealers have said they would like to hear from you directly and not through dealer council representatives. Do you plan to address the dealer body? In mid November, senior brand leaders traveled through the U.S. and saw dealers in each one of the eight business centers. They spent a week with the dealer body taking them through the plan and opening up a dialogue. In a lot of ways we have already answered their query. I have absolutely no objection to bringing all the dealers together and having an open dialogue with them in my presence. I am not unique; I am not special. But I am available to them at any time. The only question that we have to answer is whether it's effective or whether it's needed. If it is, then we'll undoubtedly do it. Chrysler Canada CEO Reid Bigland recently said 88 percent of the country's 440 dealers are profitable. Why are they more successful than U.S. dealers? The Canadian market, the Canadian dealerships, have fared better in this crisis than the American counterpart. The decrease in volumes was a lot less pronounced than it was in the United States, so they never went through that horrible turmoil or the tsunami that the U.S. market went through. How do you plan to divide your time next year? It certainly will be less than 50 percent in the United States, but I fear I will continue working almost 24/7 on both sides of the ocean.